Come on…who doesn’t smile at the colors of the Red-Footed Boobie featured on Jeopardy? How can you brighten a gloomy winter day? Maybe a colorful breakfast? My photo doesn’t do justice to this delicious, colorful guacamole dip! 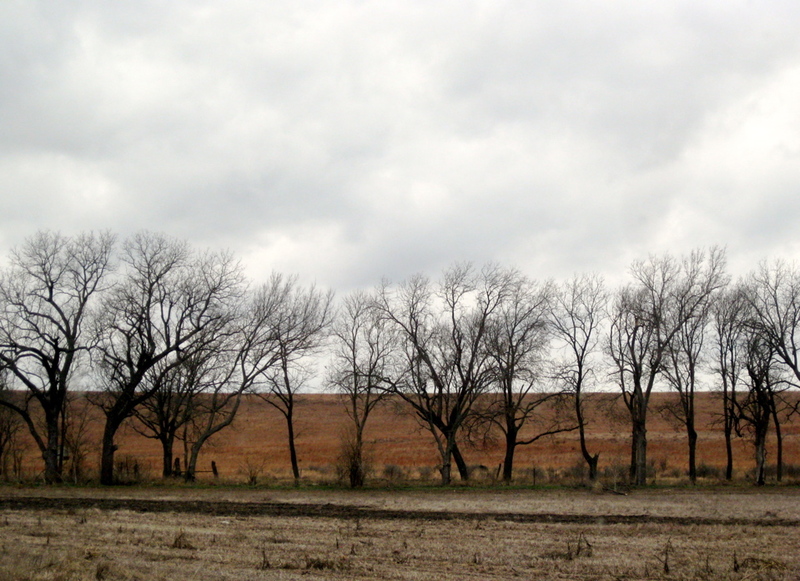 When I was in second grade, we had what felt like an extra long, very cold and dreary winter. My mother, who was an avid reader of magazine articles, created her own version of a helpful hint for brightening winter meals. She decided to cheer up our day by serving a colorful breakfast one morning. We often had oatmeal to jump start cold mornings, but this time she made a big pan of Cream of Wheat. She added some to the dog’s food, and then she heaped servings in bowls for my brother, our dad and me. As we sat at the table waiting to eat, Mom added drops of green food coloring to my bowl and stirred the concoction, then blue to my brother’s, red to hers, and yellow to my dad’s. (His was actually laughable; it looked like she’d made ice cream from snow where the dog had piddled.) My mother had the best intentions for brightening our day, and it ended up working surprisingly well. I remember us all sitting there, staring wide-eyed at bowls of food that looked like we’d tried to make science projects but had failed. My dad finally smiled, picked up his spoon, and said, “You always appreciate the cook.” The food tasted pretty much the same, and soon we were all laughing: our lips and teeth had been stained the color of our Cream of Wheat. So on that dreary day, at home and then at work and at school, we all probably made others smile, too. This winter, and on any dreary day, rise to the occasion and create your own cheer. Spice up your life and the lives of others with a surprising burst of color. 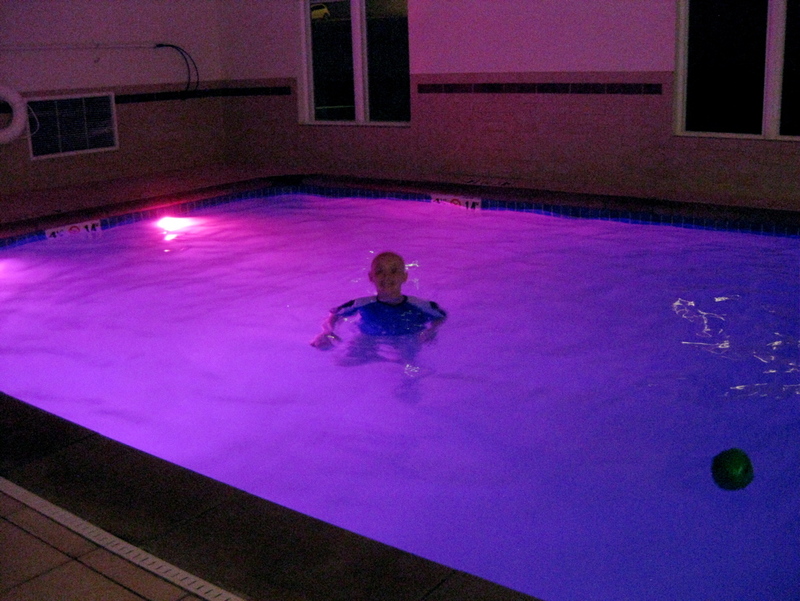 The hotel pool added water-changing colorful lights, which my grandson loved! I’ve got a picture in my head of your Dad arriving at work with yellow teeth and you children arriving at school like half a rainbow.Your Mom’s idea was great though. I love the red footed booby. Half a rainbow…and toothy smiles. That about describes it, David! And we still had warm tummies filled with Cream of Wheat. Such a combination on a cold day! What a dandy breakfast you had! I wouldn’t have thought of this like your mom did. It does remind me thought of my oldest son at age four who wanted green eggs and ham for breakfast. I tried to talk him out of it, but he begged. I said okay but made him promise to eat it. Of course it did not taste any different, but he could NOT get it down because of the color! I will admit, it did not look good. I let him off the hook but it was a great lesson about getting what when we think we want! And just a few bites of green eggs and ham would have left his mouth a delightful color, Claudia! Ah, the things moms do to fix breakfast food for their children. And if your part of Missouri is like our part of Colorado, we’ll be having another cold spell. Your mother was a special person! I think what really brightened your day was her golden heart. Have a great weekend. My mother also read magazines and loved to try different recipes. I love your mom’s idea of colouring the cream of wheat to brighten the day! How clever. My dad would have said the same thing, although he wasn’t too excited about some of the new recipes mom tried. Our dads were on the same page, Darlene, enduring some of the new recipes. But they both were polite and appreciative, too, and good examples for their children. Colour is so important. 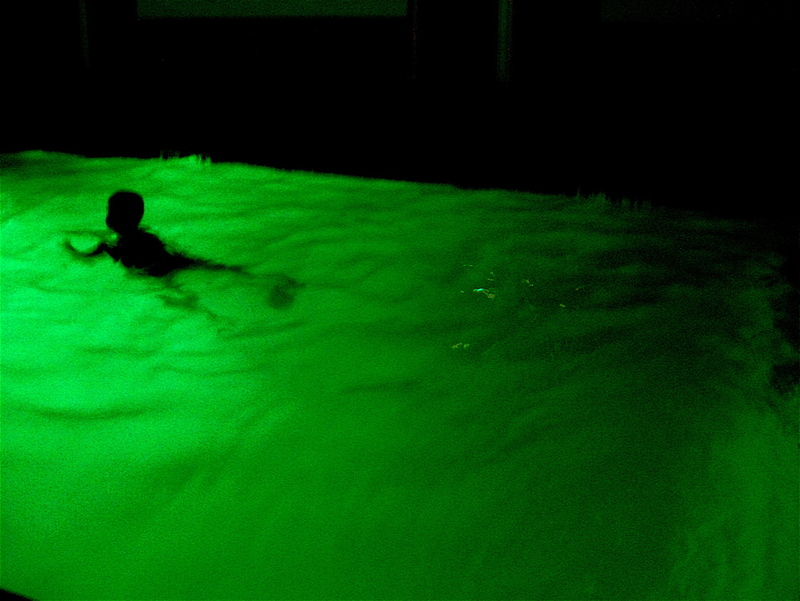 I remember a piece of installation art I saw a few years back. You went into a pure white room, like a cube, and had to stand in the middle, waiting. Imperceptibly, the walls changed through several colours, with the sound of raindrops tuning to birdsong. So clever. And calming. How wise your sweet mother was to know a little bit of color always brightens up a dreary winter day. 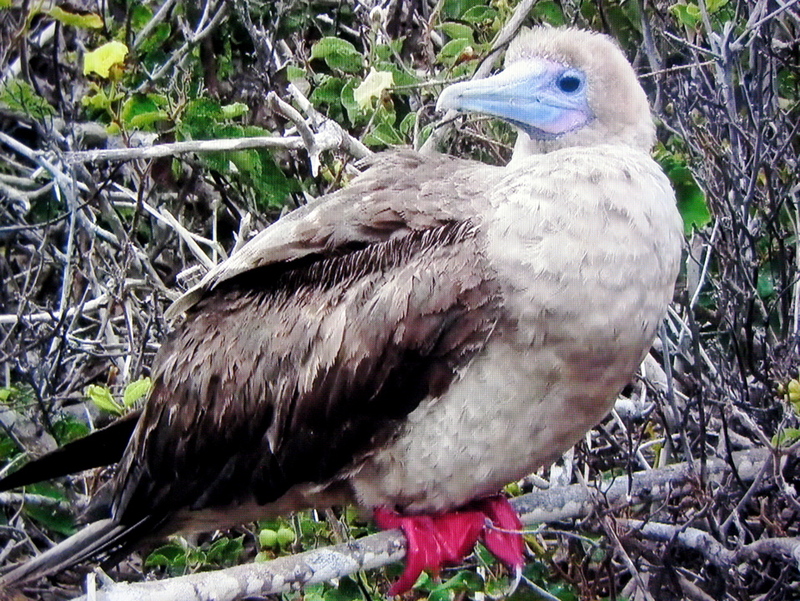 We saw the red footed booby this week on Jeopardy too, Marylin! Right now, I’m looking out the kitchen window at a beautiful cardinal forging for his pre-dawn meal. I had never see one until that segment on Jeopardy, Jill. It made me so happy that I researched the Red-footed Boobie online! I’m becoming my mother, watching Jeopardy and seeing if I can call out the answers before the contestants, which Mom used to do before the dementia. I remember seeing onr on an old Brady Bunch episode…when they went to Hawaii. 🙂 We love to watch Jeopardy! I love twinkle lights, too, Joanne. But now you have an even more wonderful way to brighten things up…by holding baby Penelope. I’ve gone back to your post again to smile at the pictures. ❤ Beautiful! What a ‘colorful’ and sweet memory, Marylin. Your memories of your mom continue to amaze us. She created so many simple yet delightful experiences for you, your brother, and neighborhood kids. What a role model for you! You did the same for Molly growing up. I also watched you come up with a steady stream of totally original, fantastic educational ideas for your students over your many years classroom teaching. And don’t forget the “Marylin Warner Original” labels that you attached to a boatload of art, craft, and sewing creations. “You da best,” sweetie. Oh, y-e-a-h. A puppy–especially a no-holds-barred, energetic explorer like our Scout–definitely is a surefire way to keep us too busy to focus on the doldrums of winter. She keeps us busy, on our toes, and too tired to worry–interspersed with moments of laughter and furry cuddles–to even think of making Cream of Wheat and adding food coloring to brighten our days. ❤ U lots, honey. Your mother has a wonderful sense of humor. And your dad understood the value of the absurd! Good combination. Cream of Wheat was such a staple for us growing up. I made it occasionally for my own kids- they thought it was quite a treat. 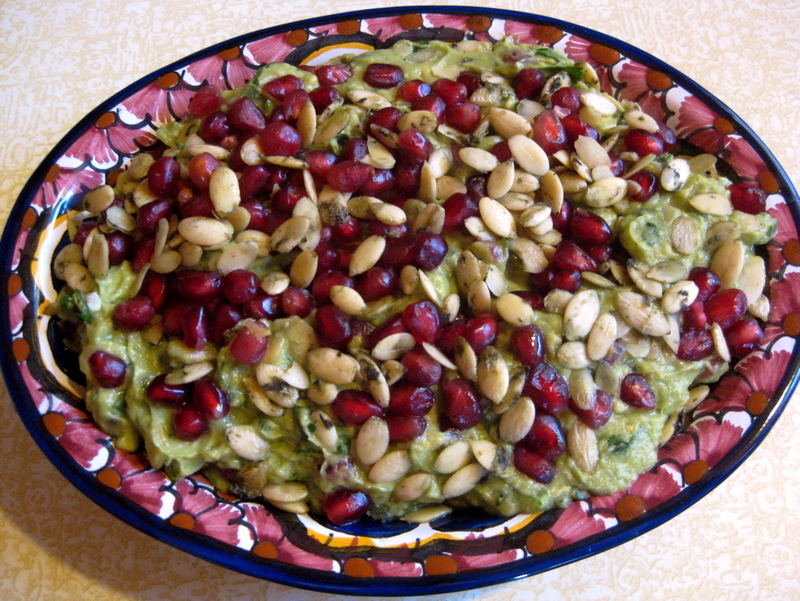 Next batch of guacamole I make… pomegranate seeds for sure! My mom and dad made a wonderful combination, they really did, and if he didn’t like some of her “original” recipes, we never knew it. This post is a tribute to your mom’s super-creativity, but also to your dad’s appreciation as Julia noted: “You always appreciate the cook.” What a parenting combo they were. The fact that your mother didn’t overlook the dog didn’t get by me either – so sweet. And who says God doesn’t have a sense of humor. Just look at the Red-Footed Boobie. You know I love color too. Just curious, I checked to find that I’ve done 3-4 blog posts on color, including the current adult coloring book rage. I did the a post of the coloring book rage, too, Marian, and during my annual Book Program for PEO I included pages from an adult coloring book. It’s so much fun to use color in our thinking and playing and relaxing. As I was growing up, our dogs had a big dog house with straw inside to keep them warm, but on cold mornings Mom made extra oatmeal or Cream of Wheat so they’d have warm tummies to greet the day. Happy 300, Marian! I’m still smiling at your grandson Curtis’ wonderful help when your baking project collapsed. What a delightful way to celebrate! Great ideas, Marylin. And you have such a creative mom! My favorite mid-winter pick-me-up is to visit the botanic gardens and see GREEN. Thanks for the reminder that it’s time to do that! Thank you for adding color to my day! You’re so welcome, Nancy. It’s good to hear from you. You add color and warmth to the day for so many people! I’ll tell Mary you like the title, Tracy. As one of the editors/proofreaders for her book THE ART OF THE SPARK, I was the one who came up with the title. I’m not a fan of Donald Trump’s THE ART OF THE DEAL, but for Mary’s theme of keeping love alive and vibrant, I thought the play on the title was really good. 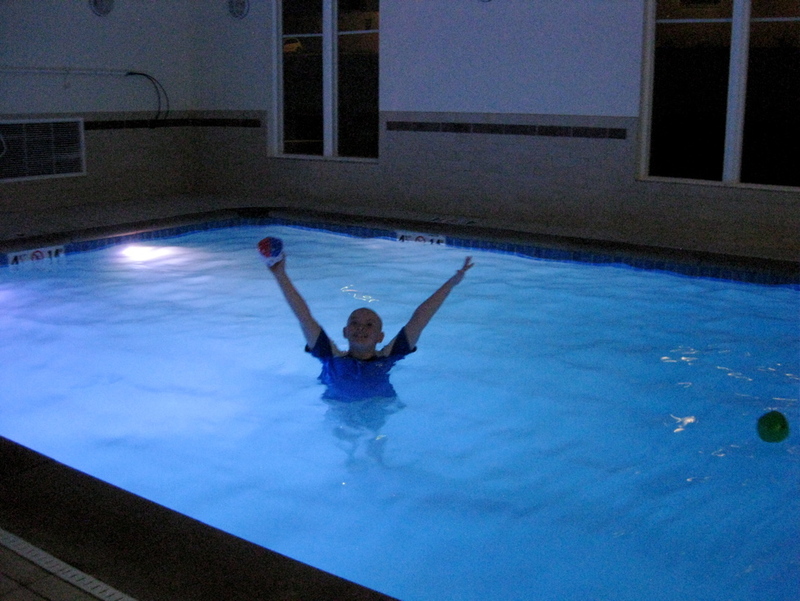 Yes, my mom really did do amazing, fun things to keep us all smiling! Oh, Jane, while my mom concocted some amazing dishes for us to try, using dog food as an ingredient was something she never did! 🙂 But it would have livened up something…especially if she’d added food coloring to the dog’s Cream of Wheat and added dog food to ours! Your mother’s creativity always amazes me, she’s truly led a creative life! A little colour in January is cheery – like the yellow gorse bushes that are bright yellow and the crocuses that have just started to appear. Flowers might bring a smile. Real or fake. Wonderful and colorful memory! It’s like the red cardinal against the background of snow–it makes you focus on something warm and bright. I just finished reading your wonderful post about going out to eat with your dad when you were 12, Sherri, and I’m still smiling. Now imagine having guacamole and Cream of Wheat as you sat there all dressed up! Love your mother’s creativity! Wow. Wouldn’t this be a great idea for various holidays–pink for Valentine’s, green for St. Patrick’s Day? My mother used to make cream of wheat too. I still like it, but my family–not so much. My son will eat it if I add cinnamon and sugar, but then, he’ll eat about anything with that addition! Just between us, I admit I agree with your son: Cream of Wheat, oatmeal, toast, and lots of other foods, all take better with cinnamon and sugar! At school I do a much better job of making sure there is constant color and fun throughout the dreary winter weather. We create art to hang in the room, bring in snow from outside which we play with and put blue food coloring in, and I even write the daily assignments in different colors on the board. I find that although I prefer to wear dark colors (black and grey) the students seem to get a little more excited when I opt for pinks, oranges and green!! Color really does have an impact on the day! Thanks for the reminder to keep everything colorful!